The Nawab of Arcot is also referred to as Nawab of Carnatic, he ruled the Carnatic region of South India between 1690 CE and 1801 CE. The Nawab of Arcot emerged under the rule of the Mughal Emperor Aurangzeb, in the year 1692 CE. Aurangzeb appointed Zulfikhar Ali Khan as first Nawab of Arcot. Sa'adatullah Khan I was the Nawab of Arcot, he ruled Arcot from 1710 CE till 1732 CE. He is also considered as the founder of the Nawayath Dynasty. The real name of Sa’adatullah Khan I was Mohammad Sayyid, he was the last Mughal governor who was appointed as Nawab of Arcot. After becoming Nawab of Arcot he moved his capital from Gingee to Arcot. He had also got control over all the territories of the Emperor in the south. 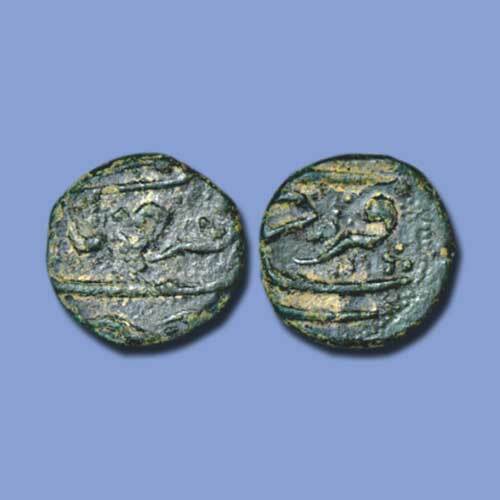 This copper double cash which weighs around 6.73g was issued by him in the name of Mughal Emperor Farrukhsiyar from the mint Trichanapali /Farrukhnagar.